Grizzly Bear (Ursus arctos horribilis) fishing along Inland Passage between Skagway and Juneau, Alaska, USA. Photographed from the deck of the &quot;Juneau Explorer&quot; on 27 August 2009. 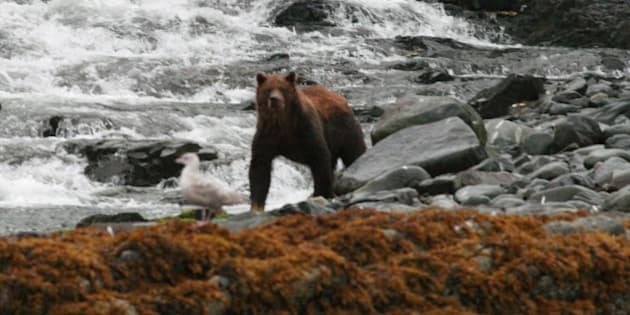 Ecotourism, including bear viewing, has grown rapidly over the past decade on B.C.&apos;s Central Coast, said Honey. People from around the world come to the Great Bear Rainforest in the hopes of seeing black, grizzly and kermode bears in their natural habitat.